We are all captivated and puzzled by the infinite, in its many varied guises; by the endlessness of space and time; by the thought that between any two points in space, however close, there is always another; by the fact that numbers go on forever; and by the idea of an all-knowing, all-powerful God. 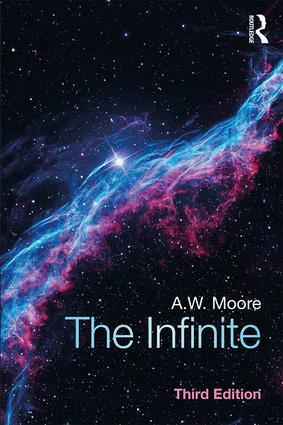 In this acclaimed introduction to the infinite, A. W. Moore takes us on a journey back to early Greek thought about the infinite, from its inception to Aristotle. He then examines medieval and early modern conceptions of the infinite, including a brief history of the calculus, before turning to Kant and post-Kantian ideas. He also gives an account of Cantor’s remarkable discovery that some infinities are bigger than others. In the second part of the book, Moore develops his own views, drawing on technical advances in the mathematics of the infinite, including the celebrated theorems of Skolem and Gödel, and deriving inspiration from Wittgenstein. He concludes this part with a discussion of death and human finitude. For this third edition Moore has added a new part, ‘Infinity superseded’, which contains two new chapters refining his own ideas through a re-examination of the ideas of Spinoza, Hegel, and Nietzsche. This new part is heavily influenced by the work of Deleuze. Also new for the third edition are: a technical appendix on still unresolved questions about different infinite sizes; an expanded glossary; and updated references and further reading. The Infinite, Third Edition is ideal reading for anyone interested in an engaging and historically informed account of this fascinating topic, whether from a philosophical point of view, a mathematical point of view, or a religious point of view. A.W. Moore is Professor of Philosophy and Lecturer in Philosophy at the University of Oxford, UK, and Tutorial Fellow of St Hugh’s College, Oxford. He is joint editor, with Lucy O’Brien, of the journal Mind. In 2016 he wrote and presented the series A History of the Infinite on BBC Radio 4.